Wagyu burger, anyone? How about glass of Cab with it? Or may be a Pinot? Luckily, it is easy to solve that dilemma – as long as you have Capital Grille restaurant close by. 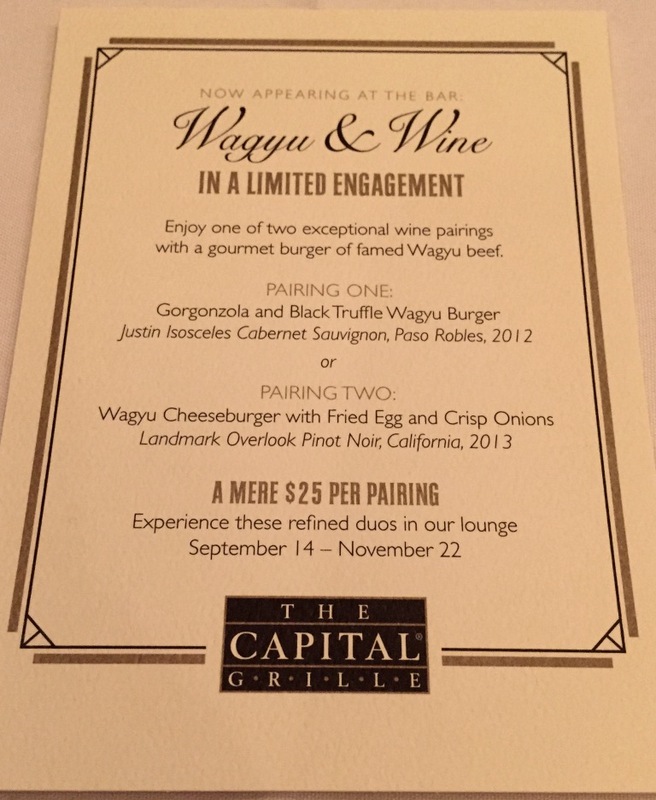 Until November 22, Capital Grille has a special offering on the menu – 2 styles of Wagyu burgers, which you can pair with either 2012 Justin Isosceles Cabernet Sauvignon, Paso Robles or 2013 Landmark Overlook Pinot Noir, California, all for a fixed price of $25, which I think is a great deal for a lunch with a glass of nice wine. It is so happened that my wife had a day off in a middle of the week – despite the fact that we both work in the same small town, our schedules never align for two of us to have lunch together during the week. As soon as I found out that she will be off on Wednesday, the plan was ready – lunch at Capital Grille it is! 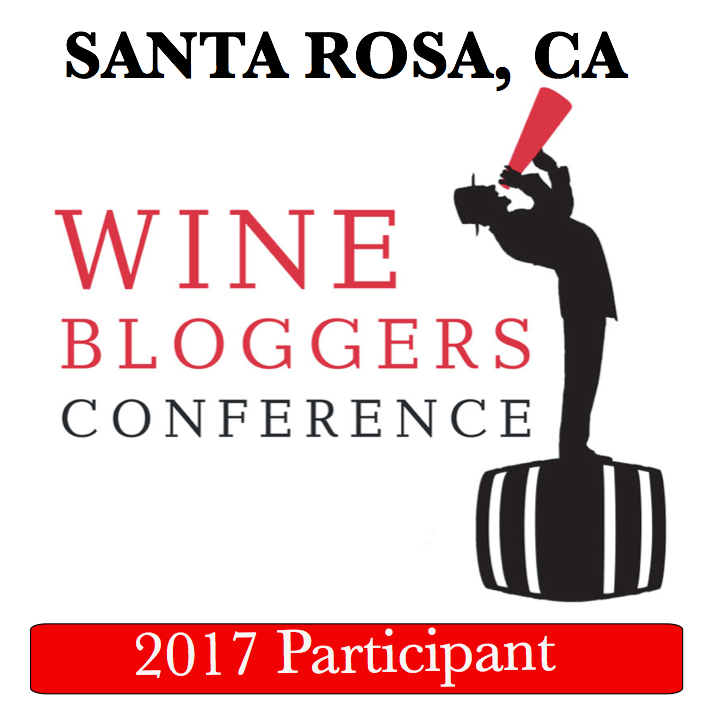 Before we talk about pairings, let me talk about the wines. 2013 Landmark Overlook Pinot Noir, California was a perfect example of California Pinot Noir – touch of smoke, ripe fruit with good acidity, ripe plums, perfect balance – definitely an excellent wine. 2012 Justin Isosceles Cabernet Sauvignon, Paso Robles (15.5% ABV, 77% Cabernet Sauvignon, 12% Merlot, 11% Cabernet Franc) was over the top delicious, ripe, exuberant, showing a touch to sweet to my liking, but still delicious and very palatable wine. And the burgers arrived. The Cheeseburger was served with Fried egg and crisp onions, and the other burger was served with Gorgonzola and black truffle ( this was my choice, and while I ordered it medium-rare-plus, somehow it had a very limited flavor – don’t know why…). So which wine do you think worked better with which burger? The result of the pairing was very interesting. Landmark Pinot Noir ended up perfectly complementing either one of the burger, and unfortunately, Justin Cab was somewhat fighting with both. No, there was no competition – but Landmark Pinot Noir still won as a pairing choice. Or at least it did so for me, so you should use your chance to find out. Head over to the Capital Grille, and let me know which pairing will work for you. Not in the mood for a burger? 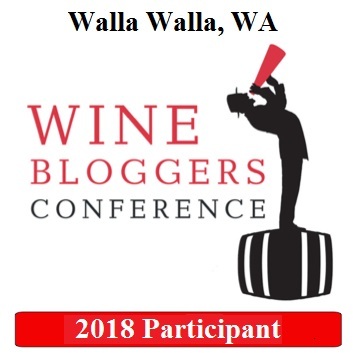 Go find those wines, as they were delicious. Cheers! The burgers and wine are really wonderful. Interesting how one wine worked with both burgers so well and the other one didn’t. They do both sound like wonderful wines and the burgers look so good. The wine was definitely delicious and a bargain in such a setting. However, burger was somewhat disappointing – I was looking for flavor and it was not there…. I think you are exactly right the Wagyu is too lean for a burger. Sounds fabulous! Now I am hungry!